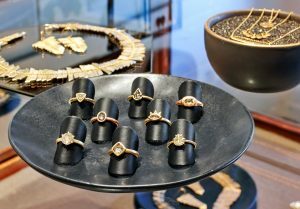 Fine jewelry meets museum-quality artifacts at this tiny shop in the shadow of the Golden Gate Bridge. 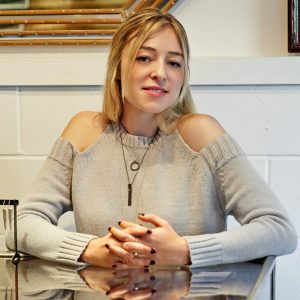 Owner Sarah Greenberg prides herself on an inventory that rivals a museum collection for its eclectic, one-of-a-kind ethos. Roughly half of the nature-inspired pieces are her own designs; the rest represent seven different artists from across the United States. The result: a quirky, funky environment with “casual luxury” items to match. Greenberg was in Boston studying to be a fine-art painter when a retail job at a local jewelry store turned into a gig doing simple repairs. “I couldn’t believe they were letting me do the repairs,” she remembers. 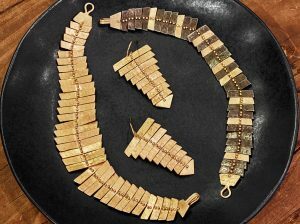 “I did a few and thought to myself, ‘This is it.’ The rest is history.” After a few months, Greenberg dropped out of art school to pursue jewelry-making. 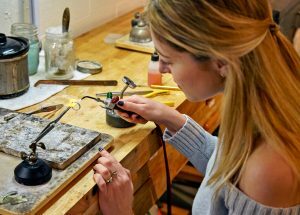 She moved to San Francisco in 2004 to attend the Revere Academy of Jewelry Arts, and upon graduation took a job as metalworker Sarah Graham’s first employee. After five years, Greenberg went out on her own with a small studio space in Oakland, Calif.